Do you think you know Virginia Senator Tim Kaine, who formally accepted his party’s nomination as vice president on Wednesday night at the 2016 Democratic National Convention? I’m sorry, no—you have no idea. This imperative slice of information came shortly before Kaine officially accepted the nomination to run as vice president on his party’s ticket. If you don’t know which piece of newsworthy fodder is greater—well, then I have no hope for this country. 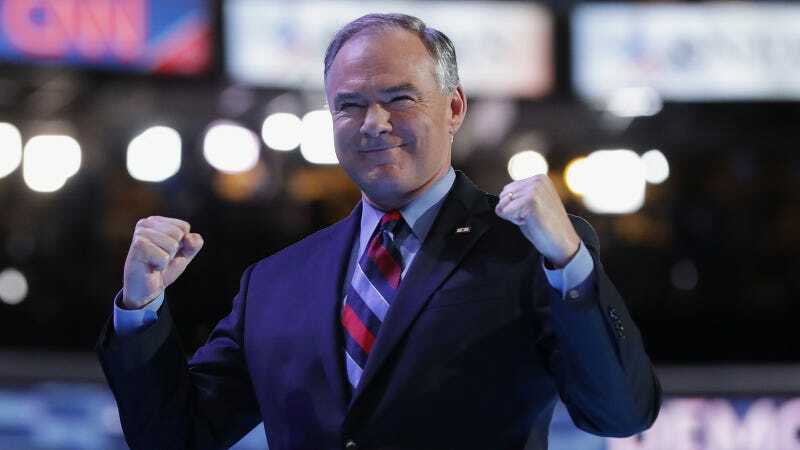 News of Kaine’s proclivity for America’s arguably most melodic metal instrument came shortly before Kaine gave his first remarks at the DNC, in which he thanked his running mate for choosing him as her second-in-command. “For my friend Hillary Clinton, I humbly accept my party’s nomination to be vice president of the United States,” he said. Kaine then turned towards the crowd.“Can I be honest with you about something? I never expected to be here,” he added, addressing attendees in Philadelphia’s Wells Fargo Center. The Minnesota-born Kaine then continued, ruminating upon his upbringing in Kansas, as well as the work ethic his parents instilled in him at a young age. After invoking appearances made at the Democratic convention from a number of advocacy-oriented guests—including Mothers of the Movement, a Black Lives Matter-centric group made up of the mothers of Sandra Bland, Trayvon Martin, and other black victims of violence—Kaine turned his attention towards GOP nominee Donald Trump. During Kaine’s corny but sincere delivery, with all those folksy “Can I be honest with you?” segues and that so-bad-it’s-good Trump impression, many on Twitter noted Kaine’s similarities to a well-meaning father, uncle, or high-school teacher. Within an hour, Kaine was transformed from a relative unknown to a legendary father figure on the level of Friday Night Light’s Coach Taylor. In true form, the denizens of the Internet duly responded to Kaine’s address. Unfortunately, no harmonicas were unsheathed after this crucial rhetorical moment. As of now, there is also no information as whether these harmonicas are all in the key of C, or if Kaine carries harmonicas in multiple key variations. In related news, other sources have confirmed that the Virginian was once objectively, aesthetically pleasing in his youth—a young Liev Schreiber, if you will. Update, 1:14 a.m. 7/28/16: At publication, there is no confirmation as to whether Tim Kaine or David Rothkopf is the the DNC’s most winsomely charming father, but anonymous tips have hinted that bets will most likely hedge on the latter. Update, 1:42 a.m. 7/28/16: This post originally stated that Tim Kaine was brought up in Minnesota; Kaine was born in Minnesota and raised in Kansas. Update, 2:32 a.m. 7/28/16: PROOF, courtesy of Gawker’s Hudson Hongo.